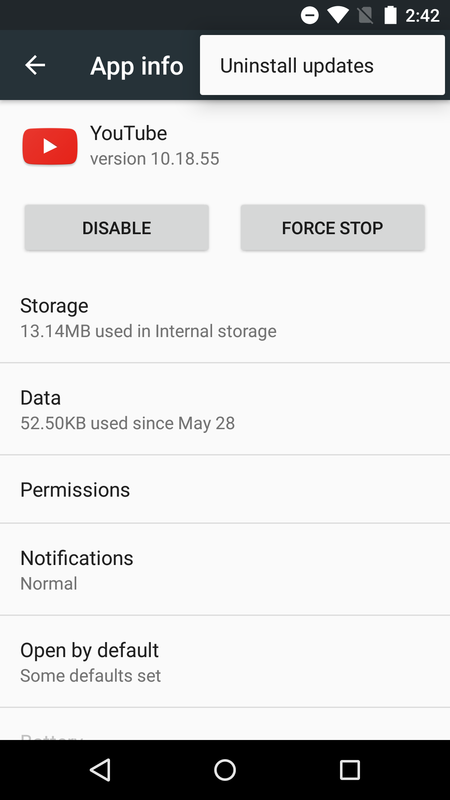 The app info screens in Android M have become a repository, of sorts, for many of the cool new features brought to the latest OS. 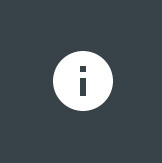 In previous versions of Android, I rarely found myself in need of going to an individual app's info screen. When I did, the actions I might have executed there were very limited. I don't know that Google necessarily wants you spending more time there in M, but they certainly built quite a bit more function into this interface. 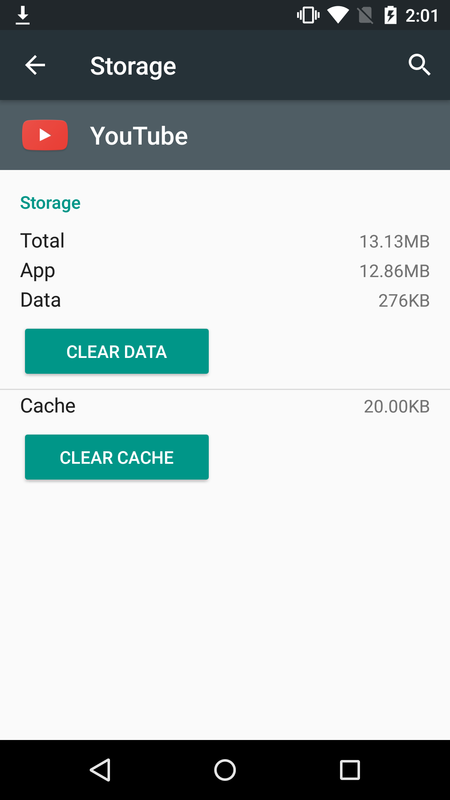 Starting at the root level of app info, you can see some of the minor changes. The "uninstall updates" button has migrated to the overflow menu, which you can see in the second screenshot. More noticeably, the info given about data storage has been truncated greatly here with the details moved to their own page, seen below. Another change is that the default app settings have, like the storage info, moved from the main app info screen to their own page. 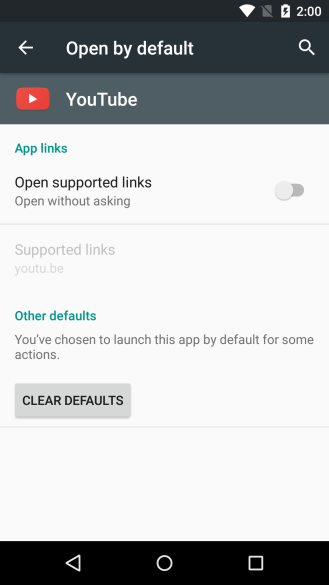 This is to make room for toggling the app's newfound ability to open links without the selector prompt. 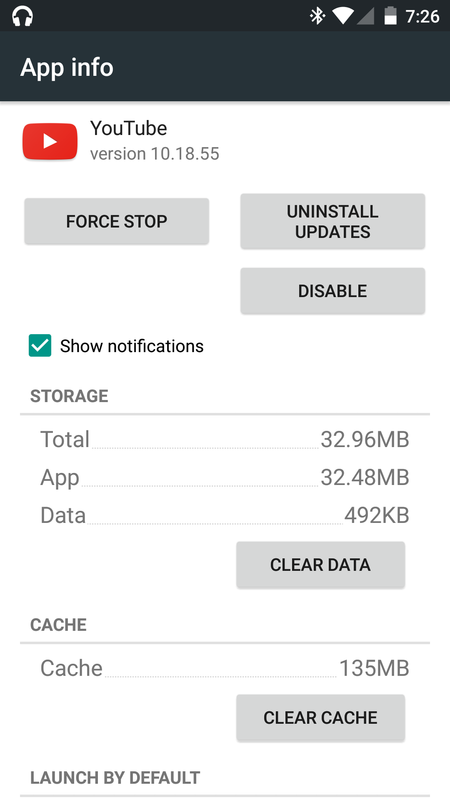 There still isn't a lot of configurability here, but the new app links caused a lot of worry when they were announced. 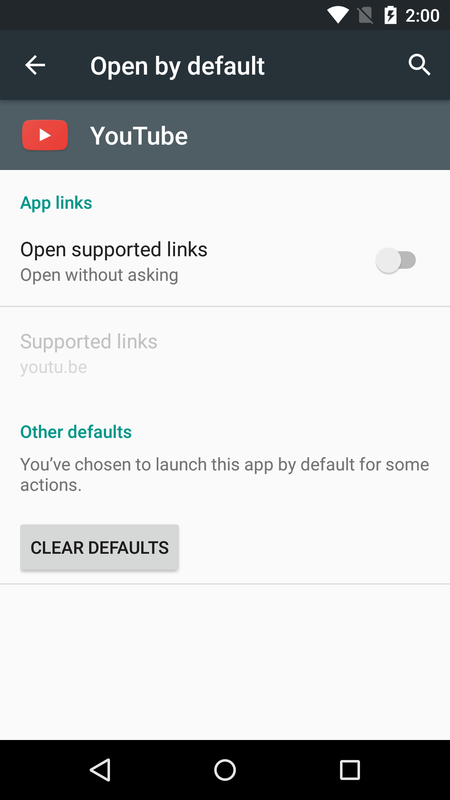 Now, as you can see in the screenshot, you could set an app like YouTube not to open up youtu.be URLs if you prefer the browser or some third party option. 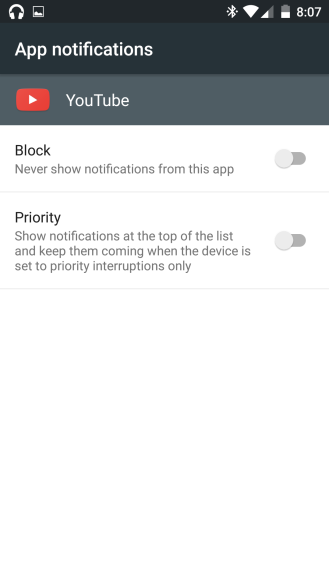 Another nice layer of options lies within the area that deals with notifications. If you get notifications from an app all the time and are sick of them covering the top of your screen as they roll in, you can simply disable peeking. They will still be in the master list of notifications, but won't interrupt what you are doing every time they arrive. You could see this level of detail in Lollipop, but had to get there from Sound & notification > App notifications > Youtube. 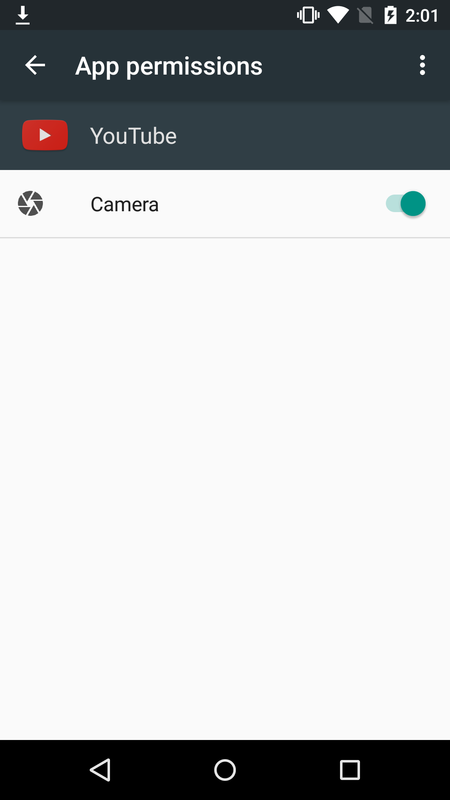 If you long-pressed an active notification and clicked on the little "i" icon, you were also brought to this screen starting in Lollipop. Now you can get to it straight from the offending app's info page. 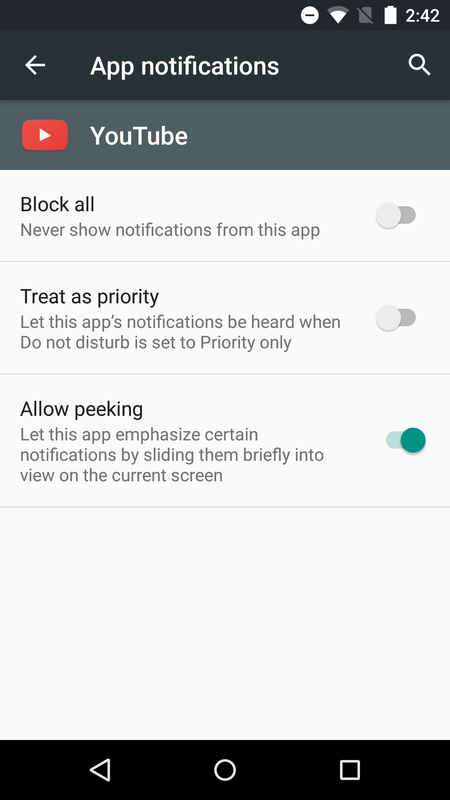 The "allow peeking" option is brand new to M, though. 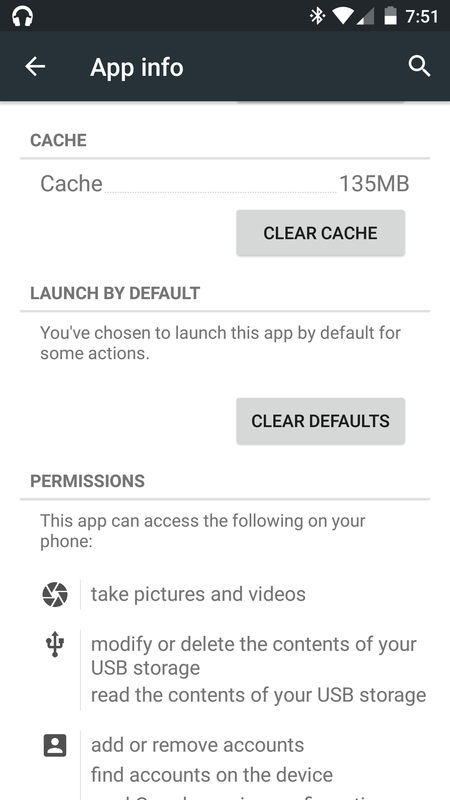 Last but not least, app info is where you can head to toggle granular permissions for a given app. 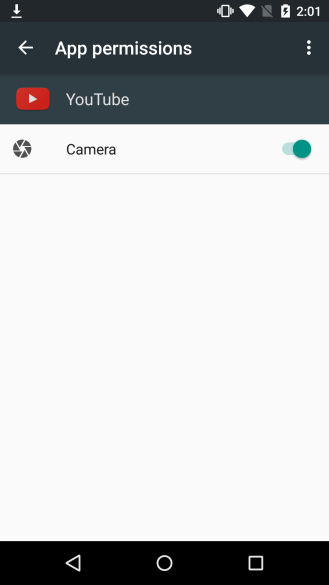 At this point, YouTube has only asked for one of the user-changeable permissions: the camera. Other apps will have more, others won't have any. 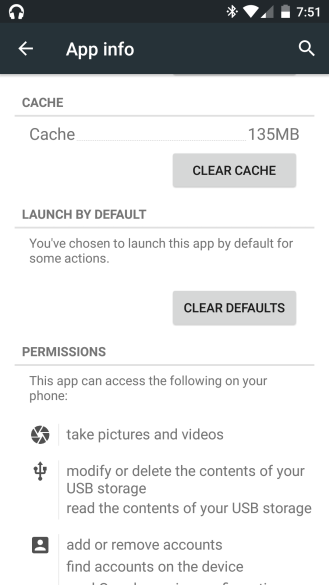 Remember that you'll be prompted the first time an app tries to use one of these permissions, so you should only need to go here if you change your mind later. One of the running themes with Android M thus far seems to be optimization, both on the low level with battery saving changes and in terms of the interface, using things like the app info screen to tie together various features in an intuitive location.